In viewing the Terminal Facilities Map of 1940 below, we can see the various locations of the terminals and facilities located in the Wallabout Basin in relationship to one another. 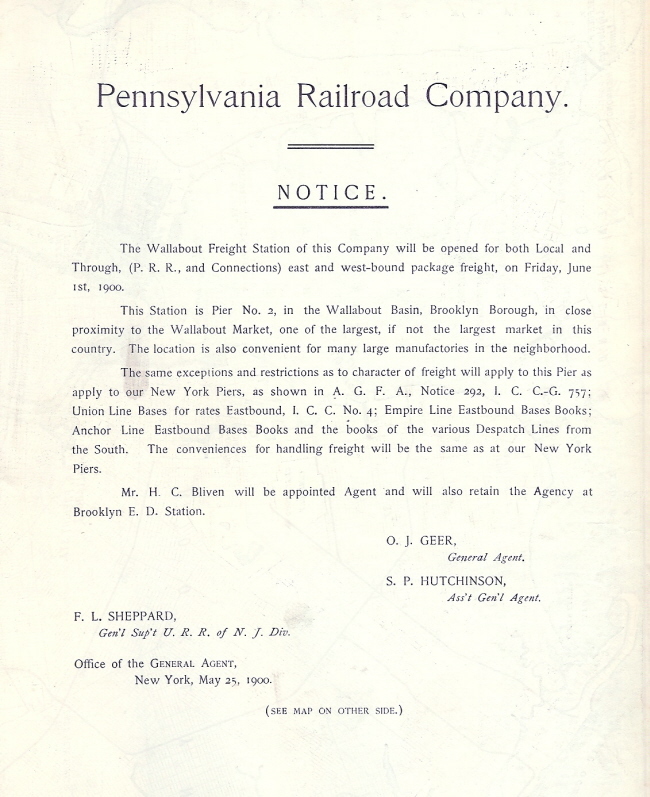 This particular page is concerned with the history of the two "pier station only" facilities: the "Wallabout Union Freight Station", (combined Pennsylvania, New York Central, Lehigh Valley, Baltimore & Ohio and Central Railroad of New Jersey); and the "Wallabout Station" of the Erie Railroad. The Wallabout Market, where the vendors would actually conduct business, would be organized at this location in 1884, after being banned from its prior location at Fulton Street, Brooklyn. The Wallabout Market was one of the premier farmer's markets in the city of Brooklyn, and according to historical accounts it was the second largest produce / farmers market in the United States. 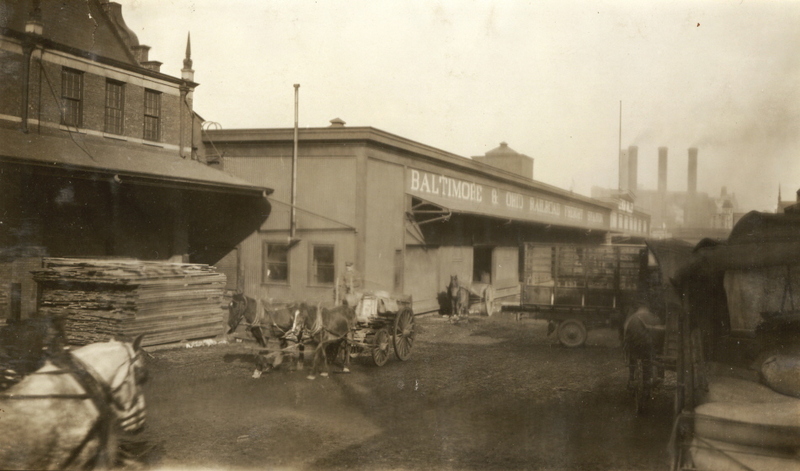 According to a 1914 article in the New York Times discussing the modernization and expansion of the Wallabout Terminal Market, there were 45,325 farmers wagons located at the market in 1913. The peak time of business transactions for the Wallabout Market vendors would be between midnight and dawn. Considering there were no to extremely few electric lights during this era, makes this a most unusual time of day to conduct business. But if one thinks about it; conducting business during the wee hours of morning ensured fresh produce delivered and ready for sale by the time the populace was beginning to stir and beginning their day. Initial research of this facility by this author failed to provide an exact start of operations date for the railroad portion of this facility, and the exact dates of construction and completion of the pier stations was elusive. Eventually, it was ascertained from the following New York Times article that the Pennsylvania Railroad would establish their presence in the Wallabout Basin at the time of this articles publication on November 1, 1898. 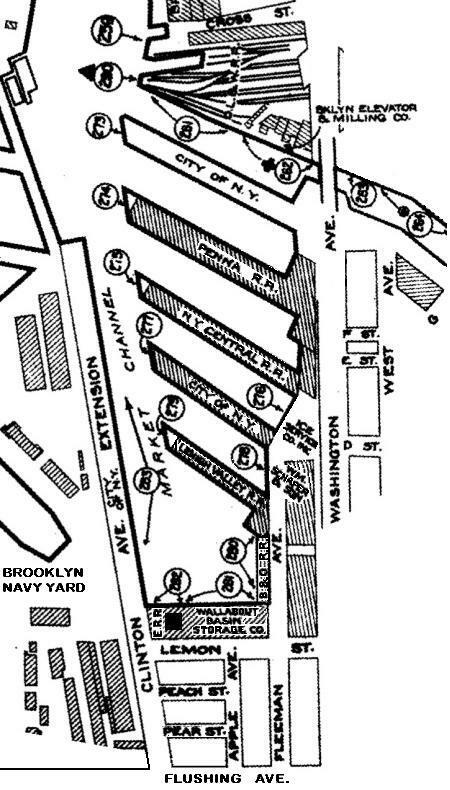 Note that the Agent & office for the Wallabout Station was retained at PRR Brooklyn E. D. Station. (Brooklyn Eastern District Station) This was the original name for the North 4th Street Freight Station south of and not to be confused with; the Brooklyn Eastern District Terminal. 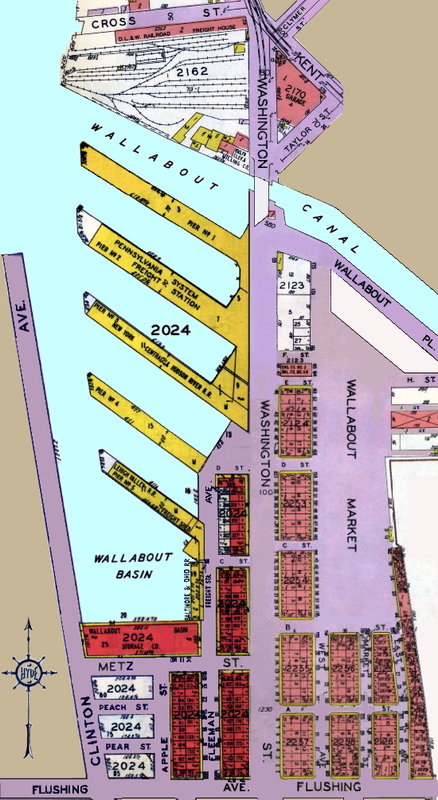 The following map is an excerpt of the US Army Corps of Engineers Port Facilities Map of 1924 for the Williamsburg / Navy Yard Area.. This Wallabout Union Freight Station facility was constructed as pier stations only, meaning it had no float bridge or team tracks. Each of the railroads named above would have their own pier or blukhead location in the Wallabout Union Freight Station. Carfloats loaded with freight cars would simply be moored to one of several covered piers and the freight in those cars would be unloaded directly into the pier sheds / freight houses on those piers. 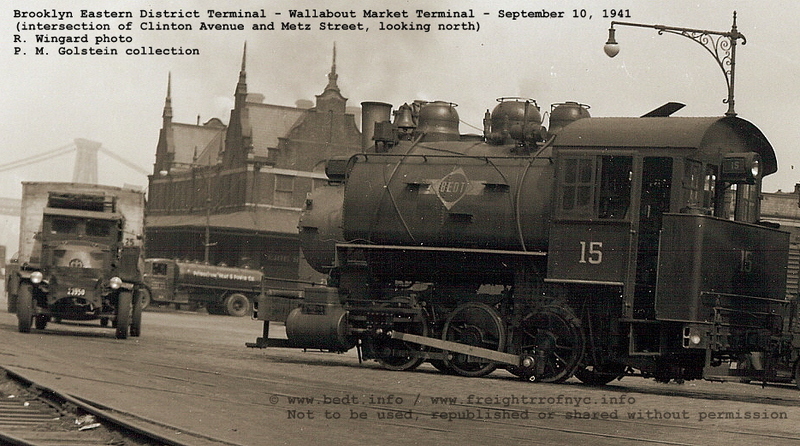 The Wallabout Union Freight Station was a multiple pier facility which served the Wallabout Market. According to the 1915 issue of Railway Age Gazette, the following railroads serving the Wallabout Union Freight Station piers. The 1929 E. Belcher Hyde Property Map at right, shows the locations of those railroads. While the Delaware, Lackawanna & Western Railroad's "Wallabout Station" was not technically part of the Wallabout Union Freight Station, it is shown for location comparison. It should be noted that the map at right is actually a composite of three separate plates from two different volumes of the E. Belcher Hyde Atlases of 1929. 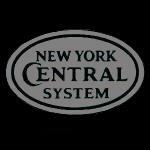 Interestingly, the New York, Ontario & Western Railroad is mentioned. 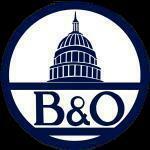 This is presumably due to its partnership with the West Shore Railroad. No further information is known at this time. 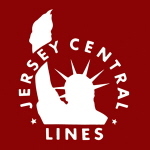 The presence of the Central Railroad of New Jersey at this location did not last long as it is no longer listed by 1913. Also of particular note is that the Erie Railroad pier station freight house on the southern bulkhead is not listed, but a Wallabout Basin Storage Co. is shown for the structure. 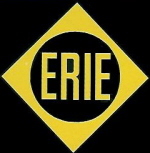 But from referencing the Port Facilities Map of 1924, we can see that the the Erie Railroad's Freight House occupied the west side of the structure and Wallabout Basin Storage Co. is shown for the east side of the structure. It is understood that the inbound freight was not so much general freight as it was predominately fresh foods, fish, produce and other perishable items which required expedited delivery. 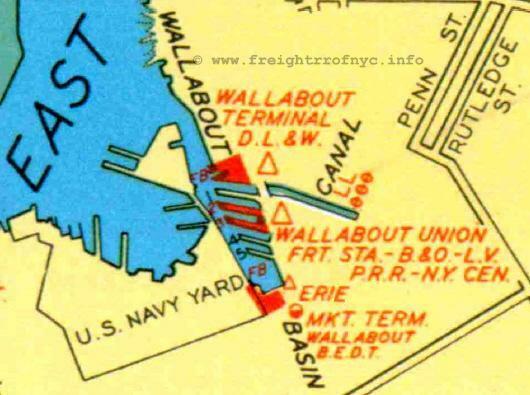 According to a New York Times article discussing the future and expansion of the Wallabout Terminal Market, there were 45,325 farmers wagons located at the market in 1913. In the picture below, located by Joe Roborecky and the inspiration for this page; was taken in 1932. I have highlighted three of the piers (Piers 2, 3 and 4) of the Wallabout Union Freight Station (upper left corner) as used by the four railroads. Heading west across Washington Street (the main north - south thoroughfare in the image) and in the open field type area is the actual Wallabout Market. The following image, which is undated at this time; is courtesy of Joseph DeMay. Mr. DeMay has been sending quite a few images "my way" to identify the location. Almost all are piers along the Hudson River. This one however, is a little closer to "home" (from a former Brooklynite's perspective). Honestly, it took me all of 10 seconds to identify the location with so many "tells" in the image: The Dutch style roofs and gables on the structure on the left, and the smokestacks (of the Brooklyn Rapid Transit / Brooklyn Manhattan Transit Power Plant at Division Avenue) in the image mark this location undoubtably as Wallabout Market. The actual open air marketplace is a tiny block to the left (which is Washington Avenue). The thoroughfare in the image however is Fleeman Avenue, which at Pier 5 (the pier occupied by the Lehigh Valley RR) jogged diagonally to the northeast and merged with Washington Avenue. The Dutch style structure on the left edge of the image is the building on the south bulkhead of Wallabout Canal of which houses Wallabout Basin Storage and the Erie Railroad Freight House. Metz Street is behind the photographer. Looking northwest along Fleeman Avenue. Photo taken by Interstate Commerce Commission and Baltimore & Ohio Railroad Inventory Crew between 1916 and 1920. The following images, a zoom in from a Brooklyn Navy Yard Archives images, shows the "basin end" of the Pennsylvania Railroad's pier station at the Wallabout Union Freight Station. 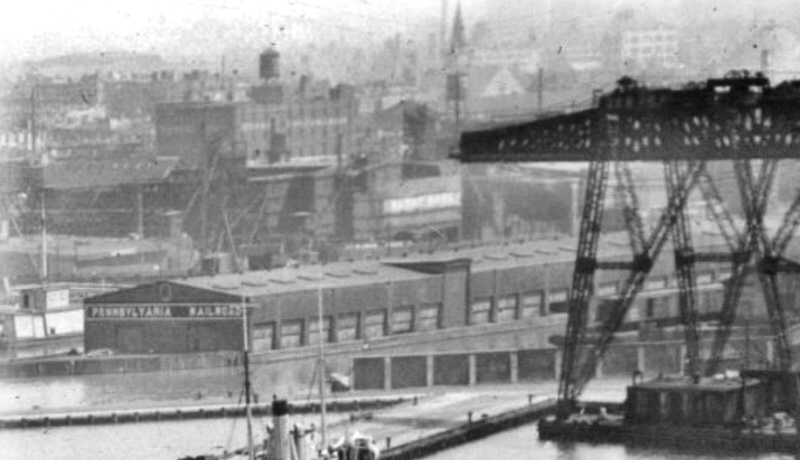 Note the station carfloat through the lattice legs of the crane. and at which time a separate page is warranted. 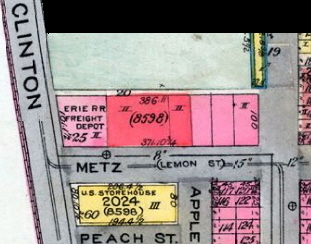 The Erie Railroad maintained a freighthouse at the head of the Wallabout Basin on the south bulkhead and on the northeast corner of the intersection of Metz Street and Clinton Avenue. Extremely little information has been located about this facility to date. According to the "Report of the Committee on Terminals and Transportation of the New York State Food Investigating Commission" published April 18, 1913; the Erie "Wallabout Station" freight house had a capacity of 10,000 square feet. 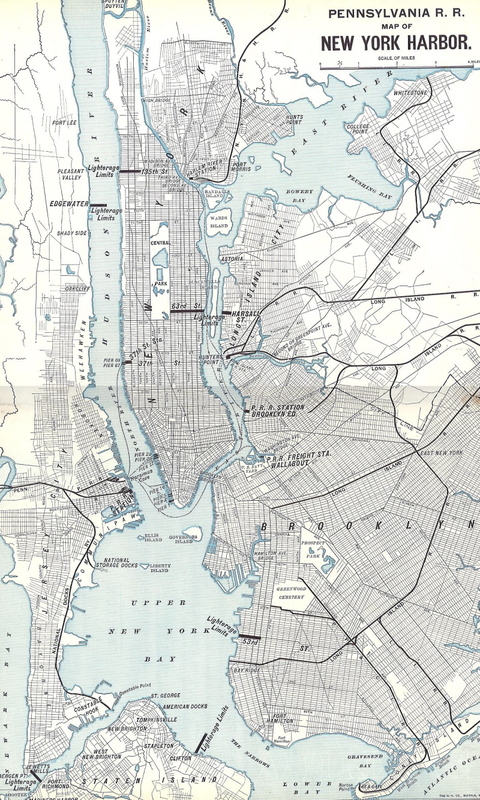 We also know it existed at the time of publication of the Terminal Facilities Map of 1940 at the top of this page. It appears from referencing the US Army Corp of Engineers Port Facilities Map of 1924, that the Erie Railroad occupied the west side of the structure and Wallabout Basin Storage occupied the east side of the same structure. 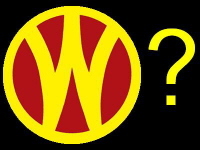 Whether the space of Wallabout Basin Storage was leased from the Erie Railroad or Erie Railroad space leased from Wallabout Basin Storage, or it either occupant leased from another owner remains to be discovered. The following image (cropped and enlarged from the original negative, was acquired from the estate of the late Frank Zahn. While the photographs subject is the Brooklyn Eastern District Terminal locomotive, it does show a portion of the Erie Railroad Wallabout Freight Depot between the front of BEDT #15 and the truck facing the photographer. Just under the awning and to the right of the tank truck, a sign can be made out "ERIE R"
The photo below, courtesy of the Brian Merliss archives (brooklynpix.com); shows a Brooklyn Eastern District Terminal tugboat heading out the Wallabout Basin with a loaded carfloat. 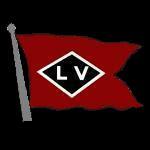 While the tugboats name cannot be seen, the sideboards on the carfloat are marked Brooklyn Eastern District Terminal. This image is included here as this photo was taken at the very head (south bulkhead) of the Wallabout Basin where the Erie Railroad Freight Station was located. 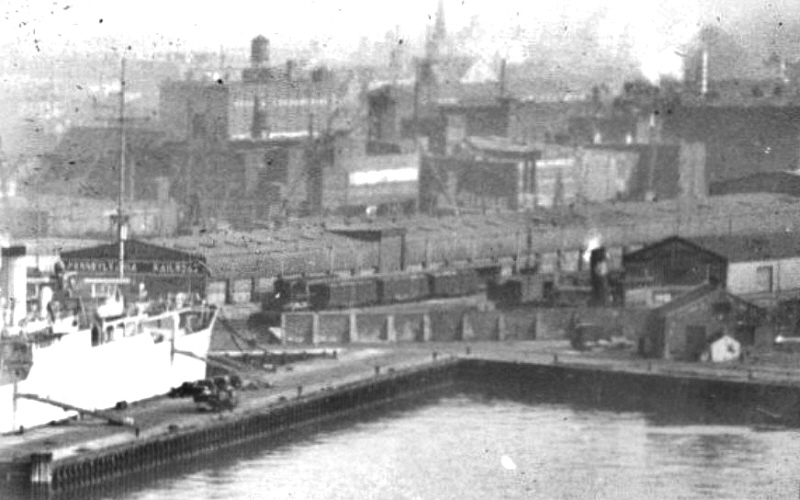 The photo was either taken from atop of a boxcar loaded aboard a station carfloat or out a second sotry window of the Erie Railroad Freight Depot. 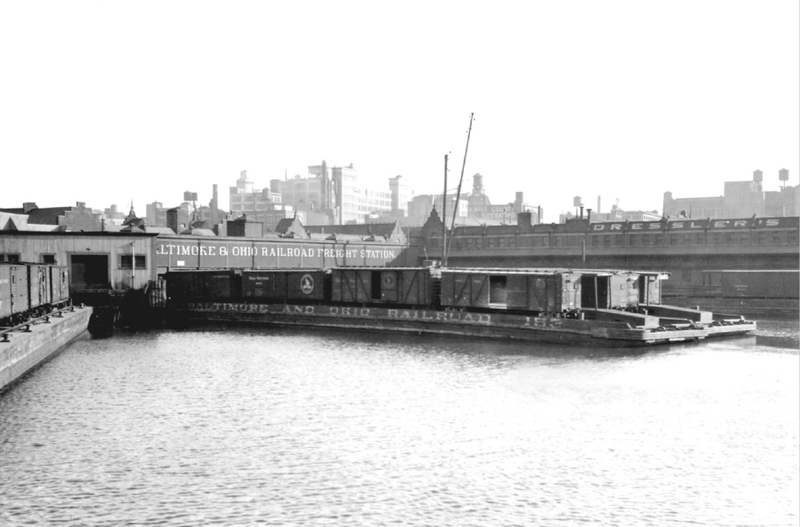 The pier occupied by the Lehigh Valley Railroad (Pier 5) is the pier with the doors on the right side of the image. The Wallabout Market Terminal operated until very late in 1941 (sometime between September through November), at which time the Wallabout Terminal property was taken over by the United States Government. The United States Government had declared on April 1, 1941 that in the process of expanding the Brooklyn Navy Yard (perhaps in preparation for the United States' entrance into or at least the material support of its Allies in World War II?) and as such, the properties of the Wallabout Market Termial including the Brooklyn Eastern District Terminal, the other railroad tenants as well as the produce vendors in the Wallabout Market; were apparently "bought out" by the United States Government. One by one as the tenants moved, their property would be seized and the structures razed. It is understood by reading some of these lawsuits, that the Wallabout Terminal property was "annexed" (read: commandeered) by the United States Government and that there was little choice the individual tenants (including the BEDT) had about it, other than taking the Government money and moving on. When the Wallabout Property was annexed, the Navy Yard property boundaries were expanded to absorb this new addition of acreage. Several lawsuits were brought pertaining to payments, interest and and other assorted legal quibbling and some of these lawsuits extended into the 1950's. We know for fact that the United States Government filed its "notice of condemnation and declaration of taking" on April 1, 1941. What we do not know is how long the tenants of the Wallabout Market were given to vacate the property. It seems entirely appropriate under the circumstances that they (the tenants) would be given a reasonable amount of time to pack up their property and relocate it to a new location. If these tenants were given 180 days (6 months), this could explain why BEDT #15 is seen switching Wallabout Market in the September 10, 1941 Wingard photo. As October 1 would have been 180 days from April 1, and this would allow BEDT to be still performing switching on September 10. If this is the case, and as most of the produce vendors of the Wallabout Market relocated to the soon to be opened Brooklyn Terminal Market, which was located in Canarsie and opened in 1942 as the replacement venue for Wallabout Market. 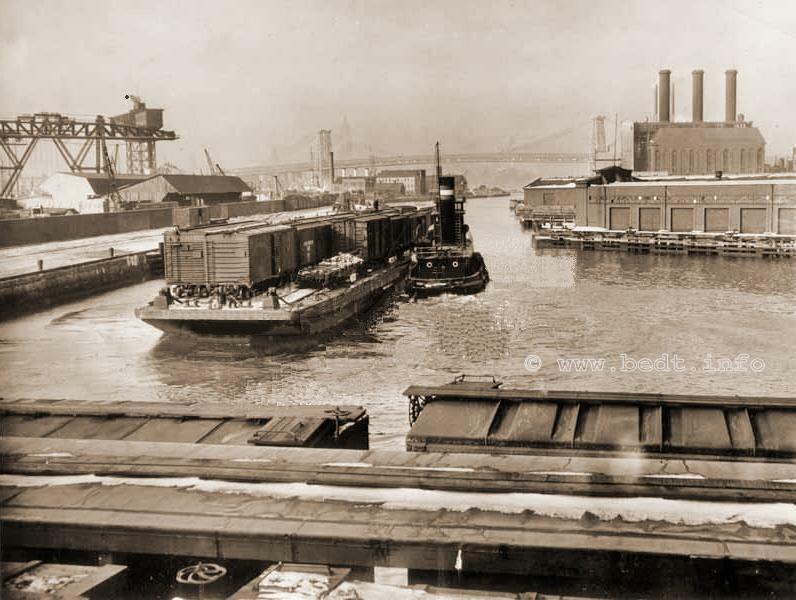 This new market was served by the Long Island Rail Road's Bay Ridge Branch, so it is then quite plausible that the boxcar (which may have contained furniture, supplies, refrigeration equipment, etc; from one or more of the tenants of the Wallabout Market) to be loaded onto a carfloat, floated to the Bay Ridge Yard, and where the LIRR could then take it to Brooklyn Terminal Market where it could be unloaded. 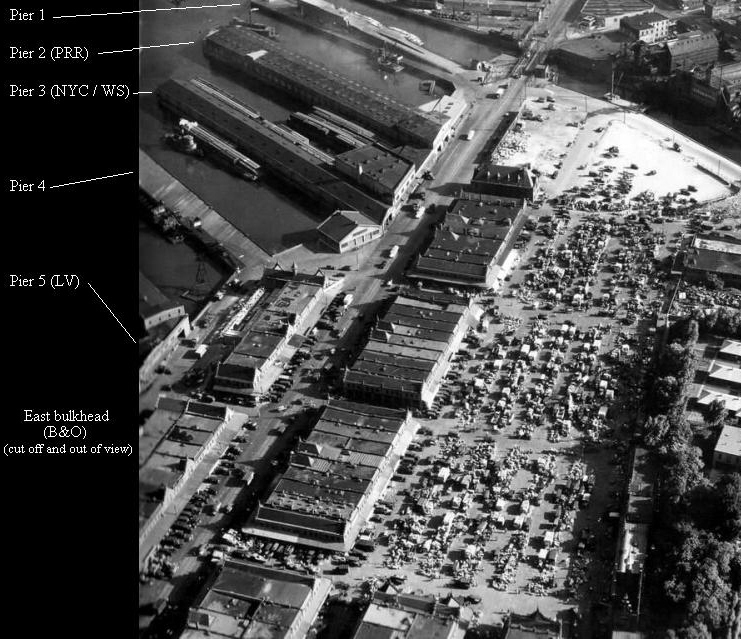 After the expansion of the Brooklyn Navy Yard, we know from the Coverdale & Colpitts Report, that the Brooklyn Eastern District Terminal would serve the Brooklyn Navy Yard under exclusive contract, renewable on a yearly basis; to provide carfloat service to and from the Brooklyn Navy Yard and the Kent Avenue property, but never directly from any other carfloat terminal however. Also according to the Coverdale & Colpitts Report, the Brooklyn Eastern District Terminal received this exclusive contract as a result of the BEDT Terminal formerly located at Wallabout Market. More details of this contract may be read i the Wallabout Terminal chpater on the Brooklyn Eastern District Terminal website..